With open space at a premium, designers are looking to the rooftops for P-patches and gardens. Seattle’s urban communities are vibrant enclaves where the idea of smart growth, densification and sustainable lifestyles are on the rise. With public open space at a premium, architects are increasingly seeking creative ways to incorporate building-design seamlessly and culturally into the fabric of these dense neighborhoods. One way of meeting these goals is through the integration of urban agriculture into the built environment. We’re seeing it take root in many urban-housing markets, including Seattle, one of the few cities in North America to include community gardens as open space in the city planning process. Establishing garden urban agriculture is a high priority for city planners, neighborhood leaders, urban residents and Runberg Architecture Group. Apart from providing healthier food options, rooftop and community gardens have significant environmental benefits to the community. The plants absorb rainwater and reduce runoff. Cistern irrigation increases fresh water reserves, and the layer of soil and vegetation provide additional insulation for buildings. Exxel Pacific is building the GreenHouse Apartments in Columbia City. The locally produced food reduces the need for vehicle-based transportation by closing the gap between producer and consumer, and provides a tangible connection to small-scale agriculture to establish a personal interest and investment in healthy eating. To support that community link, designers are establishing community gardens in creative ways. One such method is the transformation of rooftops from wasted space to lush garden oases. Outside of the environmental benefits, P-patch and rooftop gardens engage the community. Research out of Flint, Mich., found that community gardens improve neighborhood appearance, sense of ownership, property values, participation in neighborhood organization, neighborhood pride and youth development. 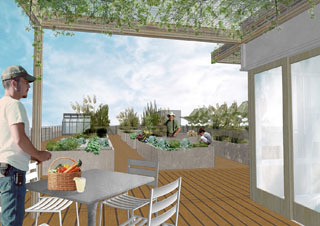 GreenHouse will have a 2,300-square-foot roof deck garden with fruit trees and berry bushes. Some of Seattle’s own P-patches have evolved into established, well-organized community networks that engage gardeners in everything from donating food grown in designated plots to local food banks to events like food samplings from the gardens with wine tastings. Food and mealtimes represent central gathering points for communities, from its preparation to consumption. Runberg took notice of community gardens back when they were just beginning to trend. Because food is a shared link that facilitates community collaboration and rapport, we started to incorporate them into the firm’s philosophy when designing projects that fit into dense neighborhoods. From rooftop gardens to easy access to transit, we try to balance the needs for unique social, economic and environmental interests of each project that ultimately enriches the quality of life for residents and the greater community. 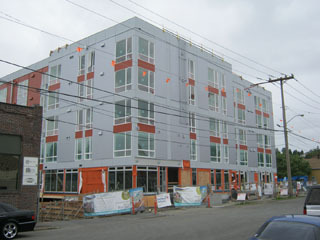 In 2003, Runberg designed the Denny Park Apartments, a 50-unit low-income housing project in Seattle’s South Lake Union neighborhood. The project uses flow-through landscape planters on the building’s podium to eliminate larger detention tanks usually required for excess water runoff. Today, the planters have been established as workable gardens and provide both a source of food and social mechanism for residents. 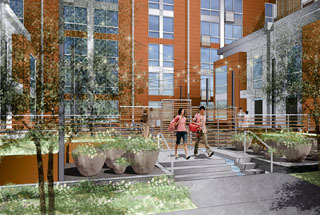 More recently, our firm designed the GreenHouse Apartments in collaboration with developer and owner Harbor Urban LLC. The apartments are in Columbia City’s zip code, which the U.S. Census Bureau calls the most diverse in the country with at least 59 languages spoken. GreenHouse has an extensive 2,300-square-foot roof deck garden and edible landscaping with abundant fruit trees and berry bushes. Our designers, along with Harbor Urban, were inspired by many unique aspects of Columbia City, including the nearby Columbia City Farmers Market and the diverse representation of cultures and ethnicities in the neighborhood. Residents here value the communal and social qualities of food preparation and mealtimes. The roof deck garden will be accessed through a gate. Other cities throughout the world are rapidly implementing various forms of urban agriculture into their urban communities. Densely populated areas like Hong Kong and Singapore now grow up to 25 percent of their produce within city limits. With half of the world’s population concentrated in cities, it’s becoming even more important for planners, developers and architects to incorporate community gardens into the built environment. In the U.S., cities such as San Francisco have established hundreds of urban farms. Our nation’s capital has an innovative incentive program that offers a $5 rebate for every square foot of existing roofs that are transformed into green roofs. Chicago, which has encouraged this type of development for more than a decade, offers tax incentives to accelerate the planting of green roofs. And, The Rocket, a green mixed-use building in east Portland, raises numerous herbs and vegetables on its rooftop garden for one of its restaurant tenants  Noble Rot. Not long ago, edible rooftop gardens were something fanciful for a SoDo loft or Belltown condominium high-rise. More responsible ways of developing the built environment and harvestable rooftop gardens serve as a unique catalyst to unite diverse residents and neighbors over the commonality of food. Urbanization is changing human demands and straining natural resources. Integrating urban agriculture into Seattle’s planning and development is an economic, environmental, and socially appropriate way to make our city more sustainable and livable for future generations. Brian Runberg, AIA, is the principal architect for Runberg Architecture Group. He has 22 years of experience in residential and commercial projects for both public and private clients. Is there room for young families in the city? Is it too late to invest in apartments?